I’m having a hard time coming up with words to describe how excited I am about today. I’ve dreamed of cookie-ing the Twelve Days of Christmas ever since I scored these cutters from a second hand store. Unfortunately I always seemed to run out of time when Christmas came around. This year I decided that if I was going to cookify this Christmas classic I would need a little help. 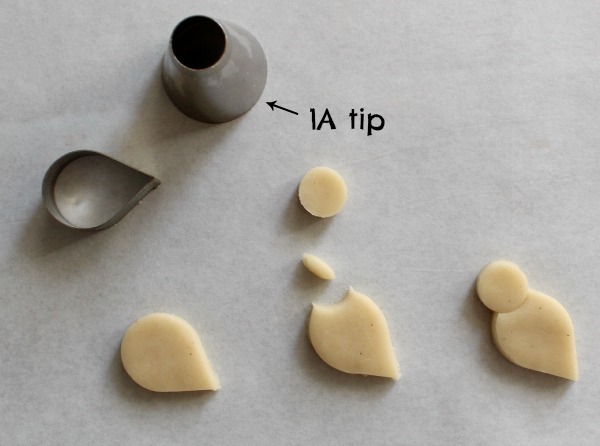 So, I asked eleven cookie friends to help me out. And since this was my bright idea, I went first. Y’all know the song, sing with me now. 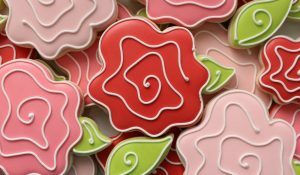 I think I should start off by saying that this is actually an advanced cookie design, which I usually try to stay away from when blogging. My logic is that an advanced decorator is usually more interested in their own designs and complex designs can be discouraging for a beginner. So rather than an step-by-step tutorial I tried to touch on the most important aspects of the design. 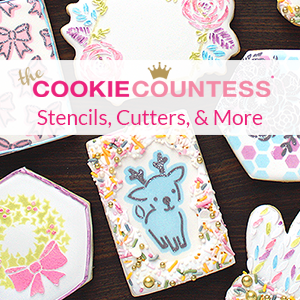 I used a scalloped oval and mini-partridge cookie for this project. 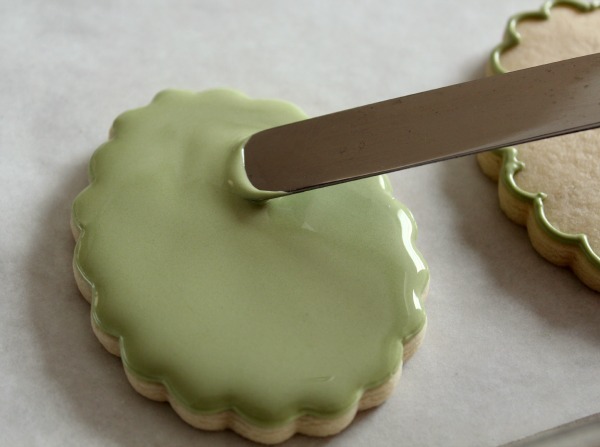 If you don’t have a scalloped oval cutter, try this trick. The mini-partridge was a little trickier. I ended up combining a small teardrop with a circle I made using a 1A piping tip. 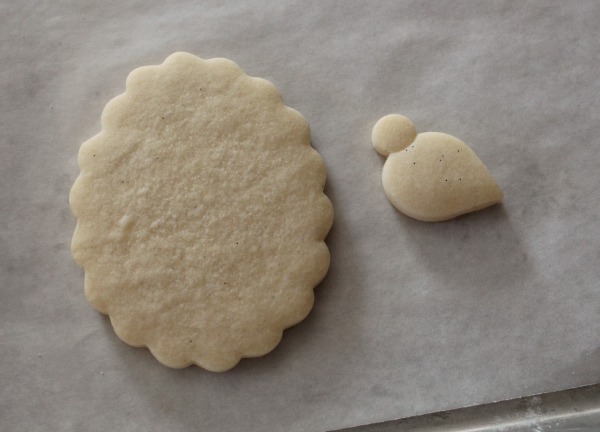 To begin, outline and flood the “tree” cookie. 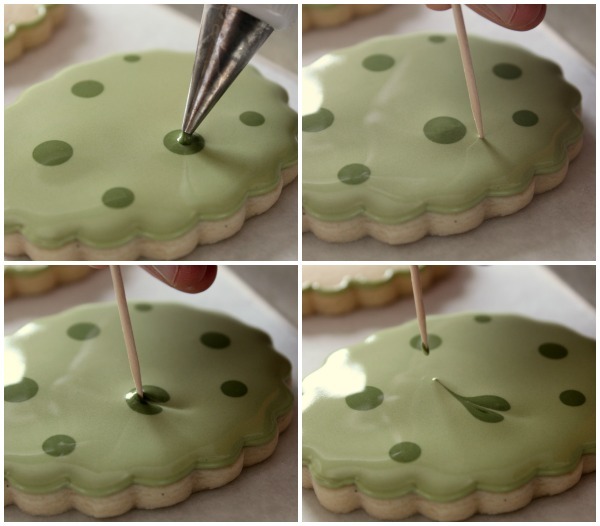 While the icing is still wet, drop in a darker shade of green and use a toothpick to create leaves. 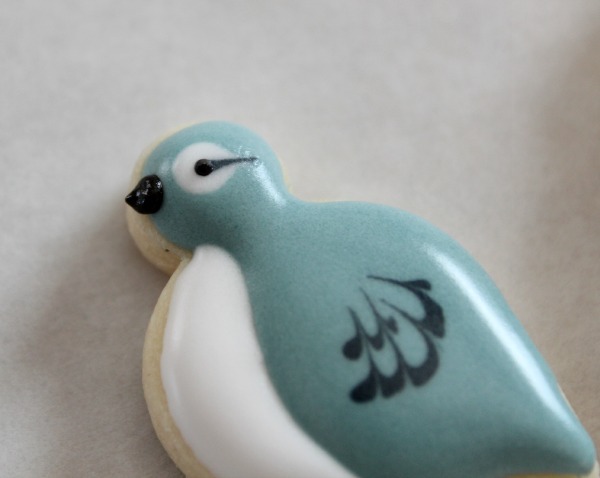 While the base cookie dries decorate the partridge with 20-second icing. 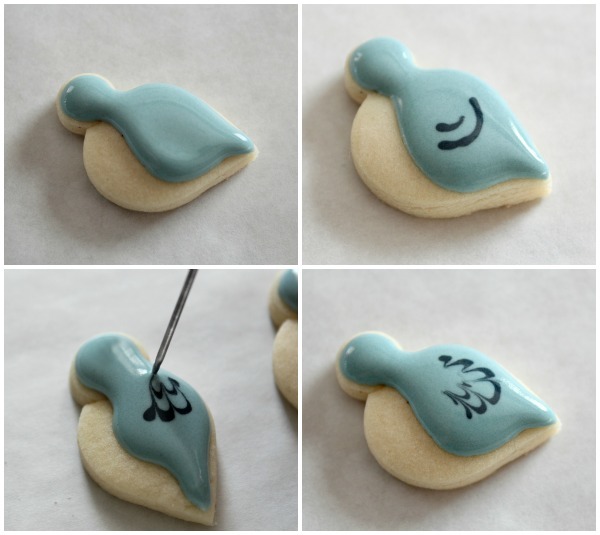 I used a needle tool rather than a toothpick to create the wing detail because of the small size of the partridge cookie. To create eyes, layer white and blue icing and used the needle tool once again, as with the wings. 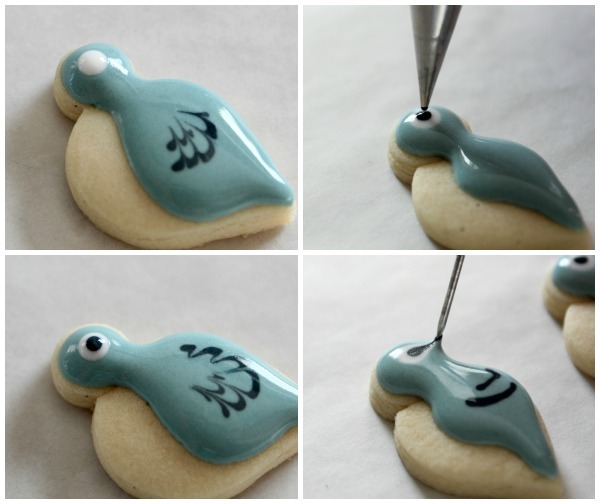 When the icing was partially dry, gently add an eye and beak using stiff icing and a very small tip. 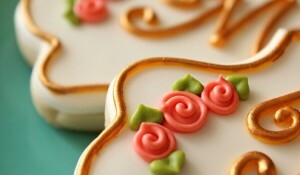 Let both cookies dry overnight, then use royal icing to attach the two. Use 20-second icing to add pears. For teeny tiny pear leaves, a #65s or a #349/#352s works wonderfully. I debated adding a few red berries, but in the end I decided that simple was best. Happy holiday decorating, cookie friends! This is so elegant! I love the partridge and the pears are adorable! 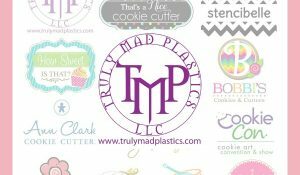 You have amazing style and it really shows in these cookies! I can’t wait to see what everyone else does! This is going to be an awesome 12 days!!! I actually was quite fascinated by your intricate design. You make me speechless! Oh these are sooo beautiful! I can’t decide what my favorite part is (the tiny pears, the leaves, the adorable partridge), but I think I’d have to say it’s the colors. Gorgeous colors, and they look so lovely together. Beautiful work! I’m so excited to see what you have in store for us with this theme too! This is a beautiful start! These are beautiful! Even if they are advanced you do a wonderful job of breaking down all the steps! This design is just delightful! Thank you for sharing your teeny tiny techniques! So beautiful, looking forward to seeing all 12 what a fun idea! Your cookies are so great! So, so beautiful! I love them! The birds are adorable, the leaves are cute, the colors are perfect! 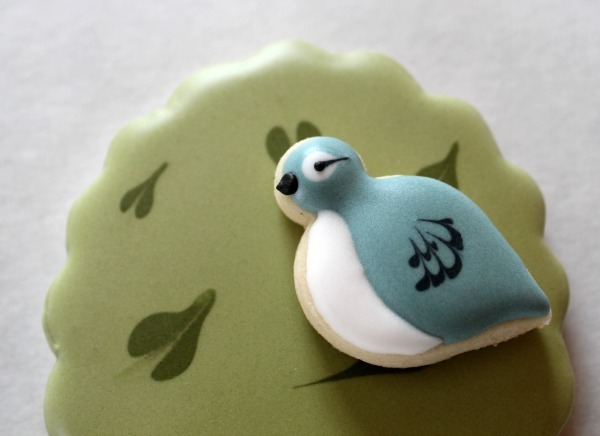 Love your little partridge cookie, so adorable. What an artist . … your work is beautiful and your tutorials are so easy to follow. I’m looking forward to the next 11 cookies. Merry Christmas! Gorgeous, Callye! I absolutely love the eye detail – definitely going to try that! These are just beautiful! I love the color scheme that you use and the design and dimension are just wonderful! This project is going to be fun to see! Again, love your cookie! This color palette is really catching my eye. So very beautiful! The details are all perfect the partridge is “la piece de resistance” really beautiful work, I love his eye. Oh I just saw you changed your page header to your holiday one I love this one. While this is an advanced design – I just never grow tired of watching your technique! I hope you will do more and more advanced designs……….you teach me little things every time I watch you. Absolutely, amazingly gorgeous. I love the use of unconventional cutters, the mix of techniques and textures, the layering. Cookie genius! Geez o Pete! These are soooooo pretty! Sin palabras, absolutamente precioso y un tutorial estupendo. Wow, these are great! I can’t wait to see what everyone else comes up with in the coming days. 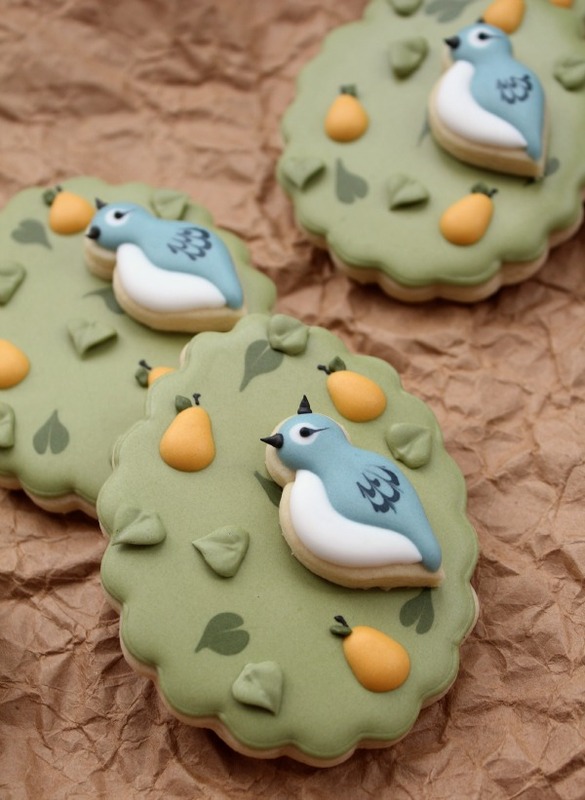 Your partridge and tiny pears are so adorable! This maybe my all time favorite cookie you’ve done (and that’s saying A LOT)!!!! Simple is best. Looks beautiful! These are so beautiful Callye. This is one of the top favorites of mine….and there are plenty of your’s I just love. Fantastic job! Beautiful and very charming! Looking forward to the coming days from the other decorator in this lovely project. I’m amazed at how talented and creative you are. Just when I think I’ve seen your best work, you outdo yourself! Beautiful work – you are an artist for sure. Too pretty to eat! Your work is amazing. Simply, amazing! These are just beyond adorable!!!! Happy Holidays!!! Thank you for a beautiful year of baking!!! Perfect timing! 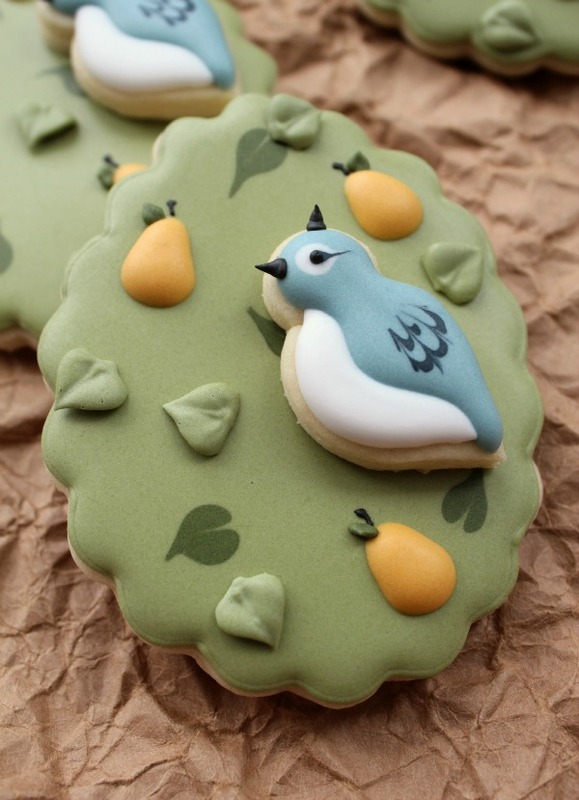 A client just ordered partridge in a pear tree cookies, and your creation is much more unique and beautiful than what I had planned. Thank you for sharing your creativity! callye, i absolutely adore this cookie! i love that you used so many different techniques, the wet-on-wet and the stiffer icing for dimension, and the little mini-cookie on top. it is absolutely darling, i am totally smitten! Pingback: Jingle Bells | Ciao Bella! I admired this when you first posted but just sat down to read through all of the posts. I wish I’d read this sooner… I learned something new – using a needle tool – just what I needed yesterday! What a beautiful cookie. I always admire your work. This palette makes me swoon. Completely gorgeous. Actually gorgeous doesn’t cut it. GORGEMOUS is the only word that fits. Have honestly never seen anything like this, you are so talented! Nobody makes cookies like these in New Zealand where I come from. I’m sure you’d make a fortune here, no competition!! Hi, I just came by to look at this website. It looks really interesting and I enjoyed viewing it, thanks for the helpful article! Callye, these are truly beautiful! A cookie work of art! You have come a long way my friend. Inspiring, thanks. Though the results won’t be half as good this is something I’m sure my son would love to try with me this Christmas. You make the impossible seem possible with all of your tutorials! Thank you so much! Muy hermosa tu galleta . felicidades .gracias por compartir tu bello trabajo. Hi – this was such a perfect idea – a wonderful, collaborative effort by all!! I truly adored the slant the person from De Koekkenbaker’s went with. 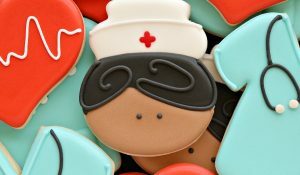 I have searched the web and I cannot find pictures of all 12 days their cookies – do you have any pics you can share. I would like to attempt this for this next coming Christmas as best I can (as best a novice can try!!). You really are an amazing person with such a talent in the arts and educating fellow cookiers I just want to thank you so much and wish you the very best in all your ventures ??? ?